Many of the cartoons that are produced today are in some aspects even better than movies. Their scenery and characters, either drawn by hand or created with the help of computer graphics, catch the viewer’s eye from the very beginning and live in the memory long after the animated film is finished. We at Bright Side have gathered together 10 extraordinarily beautiful cartoons that will immerse you in a magical world. So sit back and enjoy watching them with your loved ones. Kubo is a young boy and the heir of a great family. But when one day he accidentally summons a spirit from his past, hungry for revenge, only two of his friends are here to help him. His only chance to survive is to find the magical armor once worn by his father, a legendary Samurai warrior. With its touching story and deep philosophy, this bright Japanese cartoon is just unforgettable. Moana, the daughter of the chief of a small island tribe, decides to set off on an epic journey across the Pacific. Together with the mighty demigod Maui, she’ll have to cross the open ocean, fight scary monsters, and break an ancient curse. This charming, beautiful, and deeply meaningful story will definitely make you want to depart on a journey right away. A little girl lives in a very grown-up world with her overly caring mother. Every aspect of her life is strictly regimented, and she has no time for friends. However, everything changes when she meets The Aviator, a kindhearted old man, and listens to his stories of the Little Prince and distant stars. This magical story will make you rethink everything about your life. 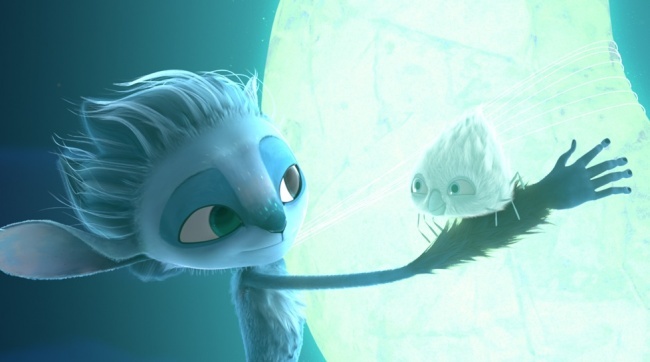 In an imaginary world, a young faun named Mune is unexpectedly entrusted to become the Guardian of the Moon. But unfortunately, he loses the moon almost instantly. Taking advantage of Mune’s weakness, the evil ex-guardian Necross steals the sun. Now with the help of a wax-child named Glim and the arrogant warrior Sohone, they go out on a dangerous journey. This unusual cartoon with the charming atmosphere of an imaginary world is definitely worth seeing. According to the story, dinosaurs never became extinct but evolved into highly intelligent creatures that live on our planet even today. The humans, however, remained at a fairly primitive stage of development. This sometimes cruel but touching and catchy story of a friendship between a young dinosaur and a little boy can’t help but inspire. The Book of Life describes a love story set against a Mexican Day of the Dead backdrop. This romantic cartoon has its own special charm. Despite the fact that the theme of death is closely interwoven into the plot, this animated film is filled with love and optimism. The Book of Life allows your soul to take flight and gives you a deep sense of inner comfort. Every cartoon created by Hayao Miyazaki is a timeless masterpiece, both in terms of plot and visual pacing. Porco Rosso is no exception. This is the story of a brilliant pilot who suddenly turned into a pig but still remained the most «human» out of all the characters. With its excellent flight scenes and wonderful scenery, this cartoon is just aesthetically perfect. Brendan is a 12-year-old orphan who lives quietly in the Abbey together with the other monks. But the boy’s life changes when he meets Brother Aidan, the keeper of the extraordinary but unfinished book of illuminations. Aidan initiates Brendan into the art of illumination, awakening a prodigious talent. The cartoon contains everything you would expect: original style, an interesting story, and unique Irish musical motifs. Finding Dory is the long-awaited sequel to the beloved modern classic Finding Nemo. This time Marlin and Nemo are on the search for Dory, a friendly blue tang fish who suffers from memory loss. She struggles to get rid of her disease and find her family. This wonderful cartoon will appeal to both children and adults. Sitting on the roof one night, orphan Tim sees a star falling from the sky. Trying to catch it, the boy finds himself on a journey. It seems everything is possible this mysterious night. The night creatures, inhabitants of the Nocturna country, reveal all their secrets to Tim, and this boy is the only one who can save them from danger. Surprisingly charming and magical, this cartoon is sure to take you back to your childhood.